Principle of pulsed laser activation of CMOS image sensor. Laser activation with the VOLCANO® semi IMAGE SENSOR Laser Optics can be controlled with the required precision so that the high temperature remains limited to a shallow surface layer. 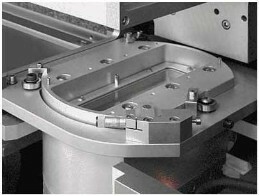 High activation rates can be achieved in either melt or solid phase processes with the required uniformity while the metal contacts remain intact. 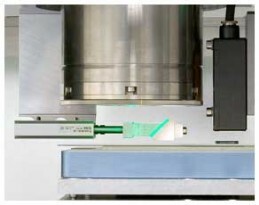 The VOLCANO® Laser Optics in combination with pulsed green lasers is especially suited for this process. The pulse duration is optimized for high activation rate of the dopant and simultaneously prevents Si lattice defects and the damage of surface textures. The VOLCANO® semi IMAGE SENSOR Laser Optics generates a laser line of up to 36 mm length and 5-10 µm width at the wavelength 515 nm. 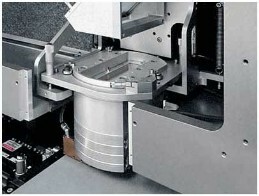 It is designed for integration into production lines and is operated with the TM 7240. The Laser Optics forms a homogenized line. The key optical component is the FALCON® cylinder p-lens, which creates up to 2.500 mJ/cm² at the substrate. Backside illuminated CMOS image sensors are a class of sensors where high sensitivity is combined with small pixel size and thus small chip size. Due to the illumination from the back side no loss of light is caused by contacts or other structures. 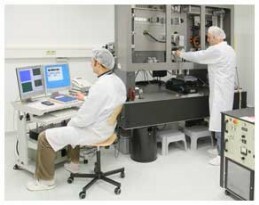 These image sensors find a variety of applications, mainly in mobile phones and other mobile devices. These CMOS sensors require the activation of a shallow pn junction at the backside surface of the wafer. Metal contacts are located in a depth of several µm which are easily damaged during high temperature pro-cesses. Thus the activation cannot be performed in standard RTP systems. Low temperature activation is limited to low activation rates. Pulsed laser activation offers much superior process results. TM 7240 combined with FALCON® line beam optics.